Governor Onaga receives report on Okinawa Asia Economic Strategy Initiative from committee chairman Moritake Tomikawa at the Prefectural Office on the morning of September 17. 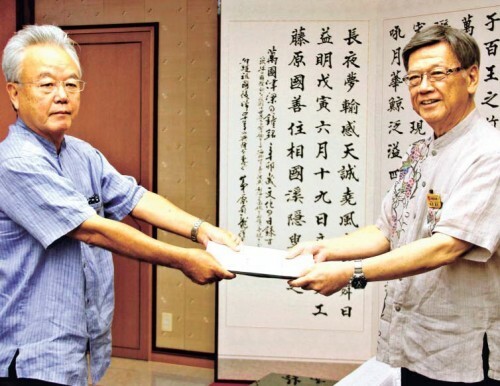 On September 17, Chairman Moritake Tomikawa of the Okinawa East Asia Economic Strategy Initiative Development Committee, one of the main pillars of Governor Takeshi Onaga’s economic policy, presented the governor with a report detailing initiatives including the buildup of airport- and harbor-related industries. Governor Onaga stated that he wants to implement dynamic, energetic policies. The initiatives drawn up by the committee will be reflected in prefectural policy starting in the next fiscal year. The initiatives are based on five pillars: (1) The formation of an internationally competitive logistics hub; (2) The formation of a world-class tourist resort; (3) The formation of a cluster of air transport-related industry; (4) The formation of an international information and communications hub; and (5) The promotion of new manufacturing industries. The report contains ideas yet to be formally proposed by the prefectural government, including proposals for the use of land currently occupied by Naha Military Port and the Japan Self-Defense Force’s Naha base, which have not yet been returned for civilian use, as well as the establishment of an Okinawa IT Industry Strategy Center (provisional name). Additionally, the report suggests the establishment of an organization that can function as a business concierge to gather and provide information necessary for overseas corporations to establish themselves in Okinawa, as well as the establishment within the Prefectural Office of a special office to promote the cultivation of globally minded human resources. The office would be in charge of cooperating with local governments and educational institutions. Chairman Tomikawa stated, “There are some elements that we have not yet been able to completely flesh out in our vision for the 21st century. Supplementing those areas is crucial for the future independence of Okinawa’s economy.” He requested that Governor Onaga establish an investigative committee to verify that the proposals drawn up in the report are reflected in future prefectural policies.